Normal View in PowerPoint 2016 is the view that you normally work in to edit your slides, move things around, add text or graphics, and so on. However, Normal View has one serious limitation: It doesn’t give you a big picture of your presentation. You can see the details of only one slide at a time, and the Slide Preview pane lets you see snapshots of only a few slides. To see an overall view of your presentation, you need to work in Slide Sorter View. Click the Slide Sorter button at the right side of the status bar (as shown in the following figure). Select the View tab on the Ribbon and then click the Slide Sorter button in the Presentation Views group. Slide Sorter View lets you see the big picture. The PowerPoint Slide Sorter View is shown here. Move a slide: To move a slide, click and drag it to a new location. Point to the slide and then hold down the mouse button. Drag the slide to its new location and release the button. 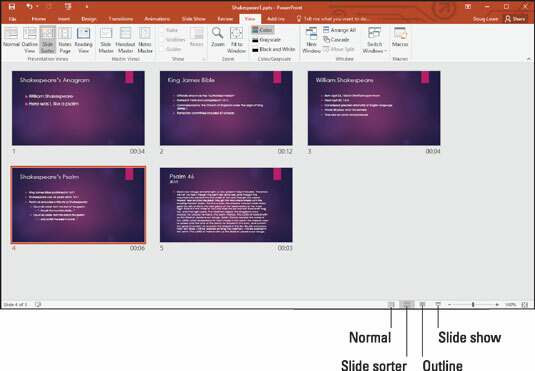 PowerPoint adjusts the display to show the new arrangement of slides. Delete a slide: To delete a slide, click the slide to select it and then press Delete or Backspace. This works only in Slide Sorter View. Add a new slide: To add a new slide, click the slide that you want the new slide to follow and then click the New Slide button. The Slide Layout task pane appears so that you can select the layout for the new slide. To edit the contents of the slide, return to Normal View via the view buttons or the View tab on the Ribbon or by double-clicking the new slide. If your presentation contains more slides than can fit onscreen at one time, you can use the scroll bars to scroll through the display. Or you can use the zoom slider at the bottom-right corner of the screen to make the slides smaller. Slide Sorter View might seem kind of dull and boring, but it’s also the place where you can add jazzy transitions, build effects, or add cool animation effects to your slides. For example, you can make your bullets fall from the top of the screen like bombs and switch from slide to slide by using strips, wipes, or blinds.